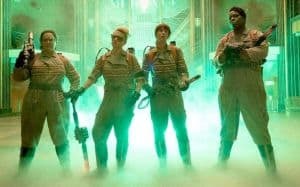 Ghostbusters Review | Nerd Much? 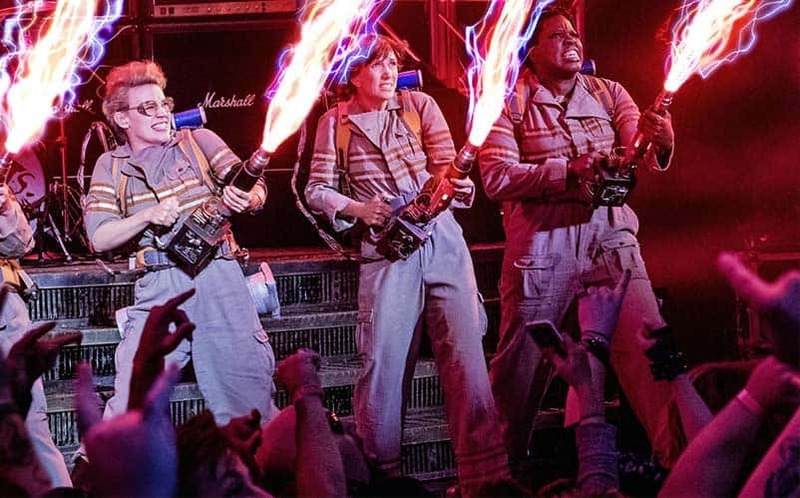 It’s hard to say if any film’s lead up has been more controversial than Ghostbusters, as the announcement alone divided the fans and critics alike. This is largely because the original films are beloved by many and the all-female cast did raise some eyebrows from certain types of people (whose views we don’t agree with here at Nerd Much). Though after seeing the new Ghostbusters I can safely say it’s not the scourge on humanity that the trailers made it out to be, but it’s not a great movie either. This horror/comedy is an entertaining, although forgettable romp for roughly two hours. Let me start off by saying I have no real affinity for the original Ghostbusters title. I enjoyed the original movie, but it wasn’t a life-changing film that’d make it into my top 20. Normally I wouldn’t bring something like this up, but given that we will eventually need to draw comparisons to the first, it’s important that you know where I’m coming from. That being said, this reimagining of the series sees childhood friends Erin Gilbert (Kristen Wiig) and Abby Yates (Melissa McCarthy) come together to finally prove that ghosts are real. The duo is helped by engineer Holtzmann (Kate McKinnon) and former metro worker Patty Tolan (Leslie Jones). One thing leads to another and they stumble upon a psychopath’s plan to release thousands of evil spirits in an effort to take over not only New York City but the world. The plot is pretty straight forward and won’t offer any big revelations or twists that you weren’t expecting. Ghostbusters is a very straight forward movie both in premise and execution, which honestly is the best choice for this kind of movie. It’s a pretty nonsensical story, but the four leading ladies do a commendable job of carrying both the jokes and narrative forward. 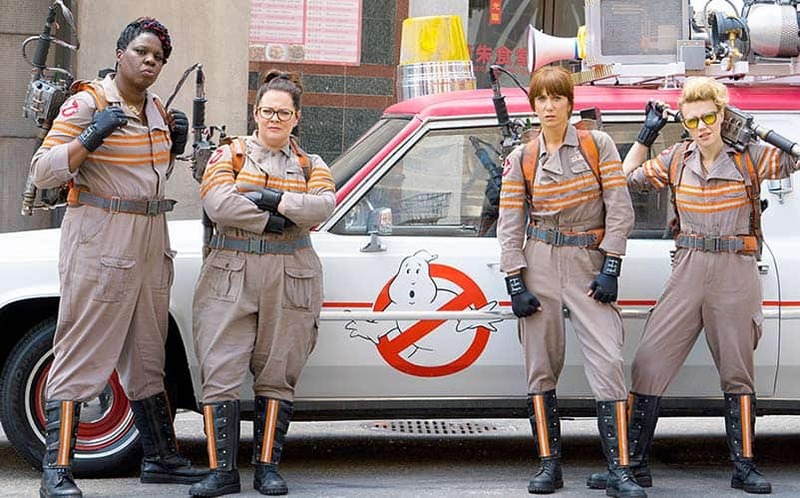 While the original Ghostbusters was played in a very straight the-actors-are-not-in-on-the-joke way, this new version very much understands we all know how silly this is and runs with it as fast as possible. Whether this is your type of humor or not will heavily determine your enjoyment of the movie. Let’s be clear, though — this is a pretty amusing movie that has some funny moments that will evoke some big laughs from audiences. Most of this is due to both Chris Hemsworth’s lovable receptionist Kevin, and McKinnon’s unstable Holtzman, both of which steal any scene they’re in. That’s not to say Wiig and McCarthy don’t have their moments, but some of their jokes are fairly hit and miss throughout. You may be surprised to hear that Wiig’s Erin has a surprising amount of depth to her character, as her reasonings for loving ghosts stems from tragedy. Speaking of tragedy, it’s time we discuss one of the biggest red flags for Ghostbusters, the villain Rowan (Neil Casey). Rowan is not a memorable character in any way and it’s pretty obvious that he’s meant to be the physical embodiment of all the haters that this film has required. Most of the jokes leveled at him are meant to be jabs at those who harshly critiqued the film for having all female leads. While this could be used in a clever way to commentate on our culture as a whole, director Paul Feig instead created a one-note bad guy that is by far the least memorable part of this movie. The CGI at times can also be quite distracting as the highly stylized ghosts look great alone, but once the final act rolls around it devolves into a special effects blowout that would make Zach Snyder blush. Thankfully, the film wraps up pretty quick once this big climax rolls in, but it’s easily drawfed by the superior first and second act. This is largely due to the enjoyment stemmed from the woman trying to capture and prove ghosts exists, mainly because the cast seems far more invested in this section than the green screen bonanza that was the third act. However, we can’t talk about this movie without discussing the massive elephant in the room. Yes, this movie is blatantly feminist, no this isn’t a bad thing (of course), and no, people shouldn’t be immediately labeled as sexist for disliking this film. It’s understandable where such an idea can come from though, as female action leads are quite scarce, even with the massive boom in superhero franchises. While that is a major problem (seriously how is Black Widow only now getting a movie??) it’s important we understand that just because a movie has four leading ladies doesn’t mean we should overlook the problems surrounding it. Ghostbusters isn’t a bad movie, but it’s not a great one either. The first two acts are quite strong and McKinnon is a force to be reckoned with in terms of the comedy genre. While Kevin had some of the best jokes by far, the other three ladies did a serviceable job. However, with a poor third act, bland villain, and cheesy CGI, Ghostbusters doesn’t get away without injury. If you’re looking for a movie to turn your brain off for and get a few laughs, Ghostbusters is right for you.